It’s not even Halloween yet. So, why are we talking about Christmas? Because holiday grooming appointments always fill up quickly, especially the Saturday appointments.If you want your Woofer all clean & fluffy for Thanksgiving and Christmas you may want to consider scheduling now. Also, if you want Christmas photos of your dogs, like this one, Standing Stones Photography will be at Woofers on the 27th and 28th of November. They will be shooting “Not Your Typical Santa” photos. Save this date! It’s the Friday & Saturday of Thanksgiving weekend. Trick or Treat at Woofers! Do you have a happy hound with a costume to show off? An excited child that wants a treat? Stop by Woofers on Halloween and get candy for the kids and cookies for the dogs! If your dog is in costume, take your photo in front of the doors to the right of the main doors (left of the nail salon) with your pet and post the photo to the woofers page. There will be a prize for one lucky participant! Don’t have a costume? Don’t worry, you can still get some free treats! Just come visit us on Halloween! The World’s Longest Biscuit Buffet is turning 3 years old this month! This 40 foot long treat buffet with over 600 pounds of treats has been a labor of love since the start. Not only does it give your favorite Woofer a chance to pick out his own treats, but by buying treats for your pets, you are helping animals in need also. Each year 10% of the gross sales from the World’s Longest Biscuit Buffet are donated to a local shelter. Last year we chose The Humane Society of Tacoma & Pierce County. The Humane Society has been doing great things for animals in need since 1888. Their previous work included everything from children to livestock, but the Humane Society as we know them now focuses mainly on pets. The Humane Society is doing good things for dogs and cats in need. Since 2014 they have been able to find homes for every adoptable dog! They aren’t stopping there however, and are working on bettering the outcomes of all the animals that come to them. Future programs include behavior therapy, hospice care, and better medical care. We are proud to support the Tacoma Humane Society, and you can be proud too every time you pick out a bag of treats from the World’s Longest Biscuit Buffet. We are celebrating our 3rd anniversary of the World’s Longest Biscuit Buffet by offering $1 off your bag of treats until November 5th! Your coupon is in this newsletter. It is combined with the Nail Trim & Teeth Coupon. Hill’s Science Diet is sold by veterinarians and many big box stores as both a general food and a solution to various problems like weight management or bad joints. They have both over the counter foods and prescription diets, and have a big share of the dog food market. We choose not to carry Science Diet because most their products contain a lot of carbohydrates. At Woofers we believe that dogs evolved to eat meat, not carbs. I’ve never seen a dog grazing in a corn field or digging for potatoes. Most of the foods made by Hill’s contain grains, potatoes, and other starches as the main ingredient. Some of their products contain by-products and other questionable ingredients like cellulose (most often derived from cotton or wood pulp), food coloring, and fillers with little nutritional value, like soybean meal run. Fortunately, Hill’s has noticed that customers are moving away from their lab-tested foods, and they have started producing a line of food called ‘ideal balance’. While this food still leaves something to be desired, because it still contains mostly grains and very little meat, it is a much more natural food and much closer to something a dog should be eating then their old formulas. We hope Hill’s will continue their progress, and continue to eliminate questionable ingredients. For now, we are not comfortable selling any of their products. I will forever wonder why any veterinarian would carry and recommend such a low quality food. Fleas are the most common parasite to affect dogs and cats, but most people forget about the cat when treating their households. If you have fleas in your household, you need to treat both your dog and your cat. If you don’t have a cat, remember that the cats in your neighborhood may traverse through your yard at night and carry fleas with them. Treat your yard with a pet safe insecticide to ensure your dog isn’t picking them up that way. There are over 2,000 different species of flea out there, but the most common one to attack dogs and cats is the cat flea. The cat flea prefers feline hosts but can host off of dogs and humans as well. If you suspect you have a flea problem in your house, feel free to talk with us here at Woofers Grooming & Goodies. We are always happy to help! Flea season is 365 days a year in Washington. Several times a day we hear, “my dog is itching.” Some of the time the itchy skin is cleared up with good food, some of the time with allergy testing at the vet, and sometimes the itching is caused by fleas. Flea season is 365 days a year here in Washington. 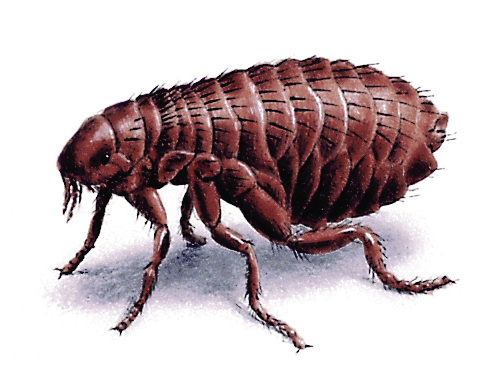 The mild winters help fleas to survive outdoors, and of course, fleas thrive indoors. Fleas can hide almost anywhere, and it isn’t uncommon for us groomers to find fleas hiding under collars, in eye sockets and in very personal areas of your dog. Fleas attack the lesser host. We often see pairs of dogs come in where one dog has fleas, and the other doesn’t. Dogs who already have poor skin are more vulnerable to fleas than dogs with healthy skin. You can help keep your dog’s skin healthy with high quality food and supplements such as probiotics and salmon oil . If your dog is constantly scratching, you can bring him in and let us check him over with a flea comb. If your dog has fleas we can usually find them, and if he doesn’t you’ll know the problem lies elsewhere. Allergies, poor quality food, and harsh shampoos can all cause skin irritation. Fleas are hard to get rid of. Your dog can pick up fleas in his own backyard, from cats, from other dogs, and even from you if one hitched a ride. Even if you keep your house immaculate, have hard wood floors, and have never had a flea problem before your dog can still get fleas. If you take care of the issue when there are only one or two fleas, it is easy to get rid of. A dose of advantage should do the trick, and not too much else is needed. If you wait until there is a full blown infestation, you will have to bomb your house 2-3 times, keep advantage on all of your dogs and cats, vacuum constantly and possibly even treat your yard to take care of the problem. Make healthy skin your first line of defense. Lyn and Kailin’s dogs come to work with them every single day, yet they do not wear flea protection and never get fleas. Ginger, Fred & Ellie are also in the back being groomed every week or two. As a dog groomer, I risk bringing fleas home to my dogs every day, and yet they don’t get fleas either. The trick is in keeping your dog’s skin healthy enough to fight off fleas on their own. Feel free to bring your dog in and ask us how we can help your dog take the next step towards better health. Want to find out what animal is most likely to spread fleas to your dog? Click here for the answer! ZiwiPeak has been getting a lot of attention lately for its high levels of palatability with picky eaters. As much as we love to see our dogs gobbling up complete and balanced nutrition though, we still want to know that the food we are feeding is made out of high quality ingredients. After all, the dog food industry has made a science out of making dog’s swallow food they would ordinarily never eat. ZiwiPeak contains no artificial preservatives, colors, salt, sugar, fillers or grains. We feel confident recommending this food for your picky eaters! Take Your Dog To The Movies! This Friday (July 17th) you and your pet have the opportunity to watch a movie together at Frontier Park in Graham. Bring a blanket and a lawn chair, and enjoy watching 101 Dalmations with your dog! The movie is FREE and begins at dusk. Come early (7PM) for pre-show games and activities. Concessions are available, and Woofers Grooming & Goodies will have a booth with free treats from the World’s Longest Biscuit Buffet!